It seems like big tech companies all want to make friends with publishers right now. Flipboard has been in that game longer than most and now it’s looking to play catchup with the likes of Facebook and Apple, with a stronger offering to the companies that provide most of the content for its apps. From today, you’ll start to see publishers, celebrities and brands get red ‘verified’ checkmarks in Flipboard, in a bid to help users quickly find what they’re looking for in search. More than 600 accounts will be verified from today, with more to come soon. Users will also see these new ‘end cards’ appear after articles by Flipboard’s publisher partners, such as The Next Web, recommending other articles based on algorithms and a topic database. When you read an article from a publisher’s section of Flipboard, all articles in the end card will be from that same publisher, a boon as the company says that tests show end cards lead to further reading 15 percent of the time. 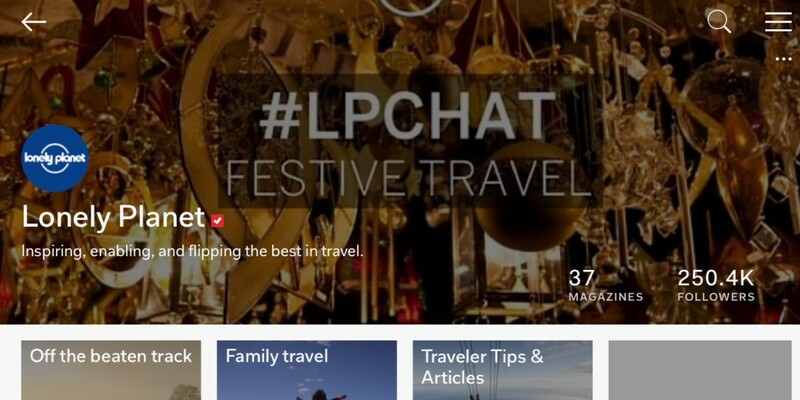 To help drive readers to Flipboard, publishers can add a new button to their sites that links to their presence on the service, and a follow button they can use to get readers subscribed. You can find the buttons on the company’s tools page. Of course, all this is only really worth a publisher’s attention if they get something meaningful and measurable out of it. Apple News and Facebook Instant Articles allow advertising, and Instant Articles can feed data to Google Analytics. Flipboard is introducing support for Google Analytics, so publishers can get detailed data about how popular their presence on the service is. It’s also set to introduce integration with Google’s DoubleClick for Publishers (DfP) advertising service soon, making monetization via Flipboard more convenient for those who already use DfP. In a world where older news aggregation apps are becoming a rare breed and Apple and Facebook are the cool new kids on the block, why should publishers pay attention to Flipboard? While Flipboard’s base of 70 million monthly active users is nothing to be shrugged at, it pales in comparison to the potential audiences Facebook and Apple can offer publishers, so keeping up with the latest expectations of content producers is key to Flipboard staying relevant.